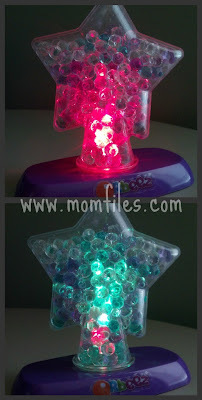 I recently received an Orbeez Light-up Star Lamp to review. This toy came with packets of these itty bitty pellets called Orbeez that come in a variety of colors. When you soak them in water for 3 hours or overnight they grow into cool gel-like balls. 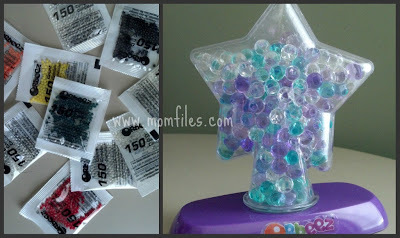 With the Orbeez Light-up Lamp you choose 3 colors (must include clear as one) and once you "grow" your Orbeez, you drain them and fill them in the star container. 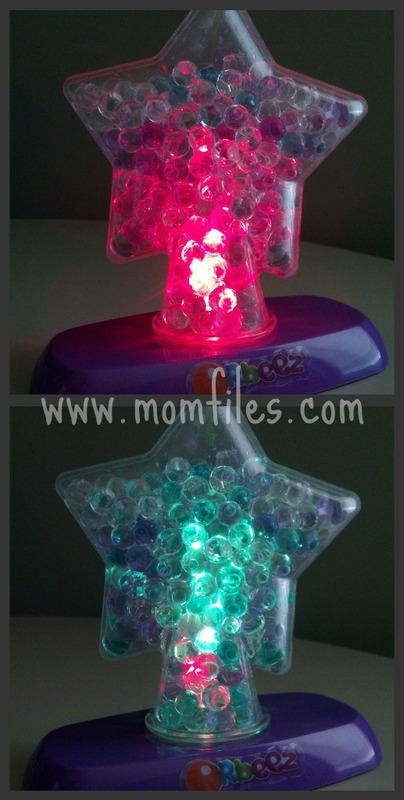 Once the star is filled you screw on the light-up cap and turn it onto the base (requires 3 AAA batteries not included). Now you just flip the switch and watch the Orbeez light up and change colors. It is such a cute item and I think any girl would like this. Although my daughters are teenagers this still appeals to them. Come to think of it, I am 37 and I want one for my desk!